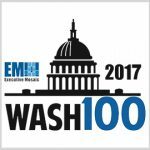 On Thursday, January 26th Executive Mosaic will be honoring the top 100 recipients for the 2017 Wash100 award. The list is comprised of influential leaders, from the public and private sector who have impacted the government contracting industry. Some of the previous Wash100 recipients include industry leaders such as; Wes Bush (Northrop Grumman), Craig Cooning (Boeing), Jerry DeMuro (BAE Systems Inc.), Marillyn Hewson (Lockheed Martin), Roger Krone (Leidos), Dr. Jack London (CACI), Phebe Novakovic (General Dynamics), and Dave Wajsgras (Raytheon).